A photo from the tulsaworld.com shows US Army Staff Sergeant Jack Martin III who was killed Tuesday, September 29, 2009 in the first deadly attack on US forces in the Philippines in seven years. Martin was killed along with Sgt. 1st Class Christopher D. Shaw in this photo from clarionledger.com. And another photo shows tha patch of the 1st Special Forces Group. ZAMBOANGA CITY, Philippines (Mindanao Examiner / October 2, 2009) – The US Department of Defense said the two American soldiers killed in a roadside bombing in the southern Philippines were members of the Special Forces. Defense officials identified those killed as 37-year-old Sgt. 1st Class Christopher D. Shaw of Markham in Illinois, and 26-year-old Staff Sgt. Jack M. Martin III of Bethany, Oklahoma. 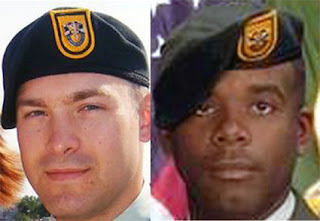 “The Department of Defense announced today the death of two soldiers who were supporting Operation Enduring Freedom. They died Sept. 29 in Jolo Island, the Philippines, from the detonation of an improvised-explosive device. The soldiers were assigned to the 3rd Battalion, 1st Special Forces Group, Fort Lewis, Wash.,” it said in a statement. The duo died Tuesday after suspected Abu Sayyaf militants ambushed their convoy in the village of Kagay in Sulu’s Indanan town. One Filipino marine was also killed in the attack. The Defense Department said the two slain soldiers were assigned to the 3rd Battalion, 1st Special Forces Group at Fort Lewis. The statement denied previous pronouncements by the US Embassy in Manila and Joint Special Operations Task Force-Philippines that those killed were members of the US Navy Seabees involved in humanitarian projects in Sulu, one of five provinces under the troubled Muslim autonomous region in Mindanao. Western Mindanao military chief, Marine Major General Benjamin Dolorfino and Philippine military spokesman Lieutenant Colonel Romeo Brawner told reporters that the slain US soldiers were non-combatants and that they were involved in a school and road projects in Sulu, where security forces are battling Abu Sayyaf and Jemaah Islamiya militants, backed by Moro rebels. The US Department of Defense said the incident is under being investigated.